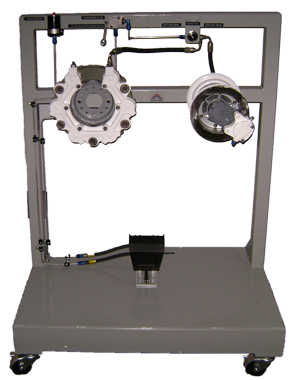 The Model AS-07 Aircraft Brake System Trainer is a training aid that displays two functional brakes representing multiple-disk brake and single disk brake.The students can be taught how to bleed the brakes.Also, the instructor can explain the procedures for the maintenance of brake system. The system includes Master Cylinder, Reservoir, Parking Brake Valve, and a Selector Valve which allows the selection of any of the two brakes for operation by the Brake Pedal. The trainer also demonstrates the functionality of parking brakes. The system is mounted on a display stand with caster wheels for easy mobility. A complete and functional single-disk brake system. The trainer can be supplied with optional CBT (at extra cost) that covers the essential topics for flexible and solid fluid lines fabrication and installation training.